The poem I have chosen for December 15th in my Advent Anthology from Canterbury Press Waiting on the Word, is Christmas and the Common Birth by Anne Ridler. You can hear me read this poem by clicking on the title or the play button. 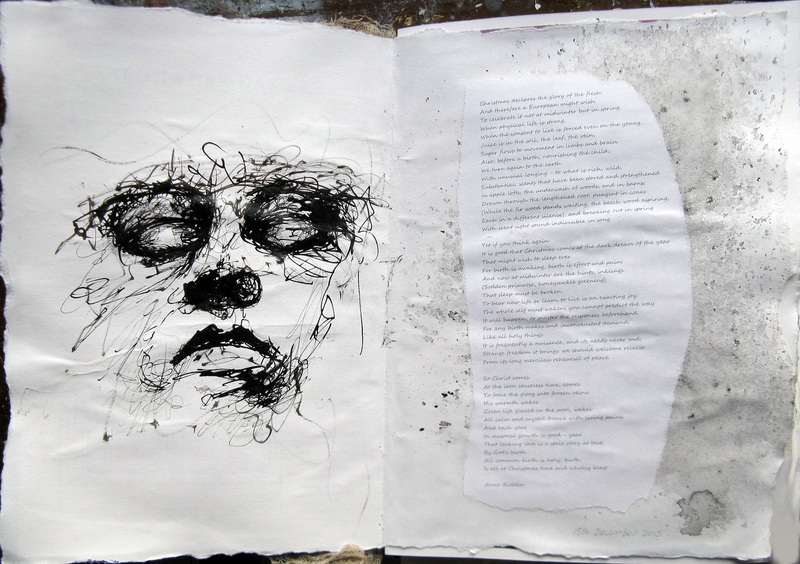 the image above, is once more from the beautiful book of art which Linda Richardson made in response to Waiting on the Word. The image for today looks, from a distance, like a peaceful, sleeping face. On closer inspection you will see it is made up of hundreds of intense scribbled lines. We can, from a distance appear calm to those around us, but perhaps our inner lives are in turmoil, those inner voices utterly draining and our value comes from what we ‘do’, not what we ‘are’. In the poem we hear that, “Christmas comes at the dark dream of the year that might wish to sleep ever…birth is effort and pain.” Our busy-ness is often a way to stay asleep, to avoid the call that Jesus and all the mystics make on our lives to wake up to a greater vision of life where we are children of God, the beloved of the Father. Our prayer today may be of a harried or sick person. This is the person God wants to be with and we come to God in the reality of what we are and with all the scribbles and scrawls that seem to make up our life. We bring all our addictions and anxieties with us and turn away from them to God, because the space inside us is the same space that contains the cosmos. One moment of true silence will find us in loving heart of the Great Silence out of which everything is and has its being.